Are you looking for business cards, compliment slips, letterheads and more? We provide high-quality printing services that won’t break the bank. We believe professional printing doesn’t have to cost a fortune, which is why we’re proud to offer prices that are leagues ahead of our competitors. In fact, we constantly monitor the UK marketplace to ensure that you get the best possible deal. 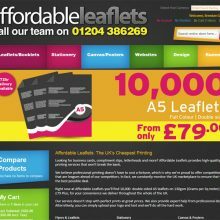 Our sister site Affordable Leaflets deals with a complete range of printing services, so whether you’re looking for leaflets for your business, or a personalised photo canvas, we deal with it all! Our service doesn’t stop with perfect prints at great prices. We also provide expert help from professional designers. Alternatively, you can simply upload your logo and text and we’ll do all the hard work. But rest assured whatever your printing services are, we will have them covered.